Chief Judge for the 11th Judicial Circuit Mark Fellheimer administers the oath of office for newly-elected members of the McLean County Board on Monday in Bloomington. It didn’t take long for the McLean County Board to resolve one of the most talked about issues of the fall campaign. Moments after the panel swore in recently elected members, including six newcomers, the board voted 18-0 Monday to move its meeting time from 9 a.m. to 5:30 p.m. on the third Tuesday of each month starting in January. New board member Sharon Chung noted the board struck down a similar proposal in 2016. “The new candidates that came in were really pushing this issue and pushing other members who had voted against it in the past that we can do better,” Chung said. The proposal which the County Board struck down two years ago in a 12-7 vote had called for a 7 p.m. meeting time. McIntyre suggested that time was deemed to be too late for some who might have a long drive home late at night. County staff’s proposal to stop providing detailed minutes of committee meetings seemed to catch some board members off guard. Staff proposed to post an audio recording of each committee meeting online within two business days to save staff time transcribing meeting recordings. McIntyre added the audio recordings are part of the county’s efforts to improve and expand services on its website, which the county recently redesigned. “We’ve got to use it and use it more, which we can do,” McIntyre said. He added the audio removes the potential for staff or anyone to misinterpret what is said in those meetings. The board approved sending the proposal to the County Board’s Rules Committee to make a recommendation by the County Board’s meeting in March. The County Board approved assignments for its seven committees and three subcommittees. McIntyre said having so many new board members created a challenge. “I couldn’t put somebody in a leadership role who has never been to a meeting or a committee meeting and is brand new,” McIntyre said. McIntyre has said he tends to favor more experienced board members for committee leadership positions and tries to mirror the political balance on the board. He noted the addition of four women to the board (bringing the total to seven) provided a new dimension for him to consider. “It doesn’t make that much difference if you are a man or a woman on this board obviously, but I wanted to make sure we had good representation for that,” McIntyre said. State Sen. Daniel Biss administered the oath of office to newly elected McLean County Board member Shayna Watchinski on Monday. Chief Judge for the Eleventh Judicial Circuit Mark Fellheimer conducted the swearing in of the new board members and county officeholders, with one exception. 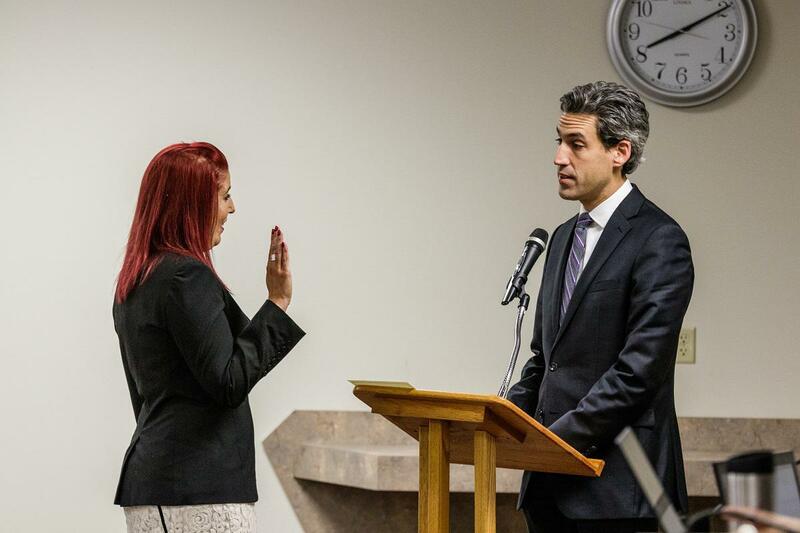 Shayna Watchinski brought in outgoing Democratic state senator and previous gubernatorial candidate Daniel Biss to administer her oath. “I look at the world now and feel hopeful because of Shayna and people like her entering government,” Biss said. Watchinski indicated the two got to know each other on the campaign trail last year. Fellheimer swore in newly-elected County Board members Chung, Lyndsey Bloomfield, Elizabeth Johnston, Logan Smith and Gerald Thompson along with re-elected members Chuck Erickson, Randall Martin, Jim Soeldner and Laurie Wollrab. GLT's interviews with the new McLean County Board members.